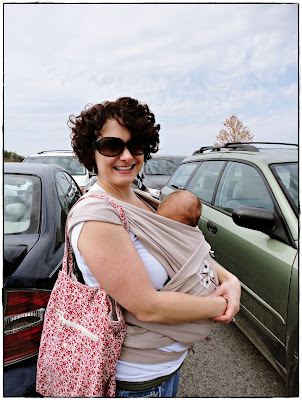 I didn't have some grand plan to become a babywearing mama when I first found out that I was pregnant with my daughter in June 2011. In fact, I was pretty much clueless as to what babywearing even was then. When I had my son in 1998, I don't remember ever hearing about wraps or slings. I had seen a baby carrier or two then, but they didn't look very comfortable for parent or baby and thus not all that appealing to me. I did the stroller with my son (who is now 14 years old, by the way) and we lugged around the infant car seat when he was a tiny baby. I first heard about babywearing from the other mothers I followed on Twitter while pregnant with Little Miss. They made it sound pretty easy, but I still wasn't 100% sold. Nevertheless, I added a Moby wrap to my registry. My thoughts were that if someone bought it for us then we would at least give it a shot. Fortunately for the two of us, one of those very same aforementioned Twitter mamas bought it for us. Now I am a total babywearing convert. I have used a stroller one time in baby girl's six months, and I was wishing in that one time that I had brought my Moby wrap with me instead. It was absolutely fabulous when she was 2-4 months old. I could swaddle her up in it, close to my chest and she would sleep as I baked. Or did the grocery shopping. Or cheered on her brother at one of his track meets. As she has got older, I am now wearing her with her legs out. She rarely falls asleep in it anymore, but she is happy and content no matter what we are out doing. Her first visit to Mommy's favorite restaurant. The Moby made eating out so incredibly easy between 2-4 months. Now I can't imagine our daily lives without our wrap and babywearing. I so wish I had known more about this when my son was born 14 years ago. Sometimes I wonder if my relationship, my bond with my daughter will be different than what I have with my son because of the babywearing. It is fun to see her face light up now when I pull out the Moby and start wrapping it around myself. She knows that we are going to go somewhere, and she knows she will be held close to mama the entire time. Safe. Secure. Content. And learning, observing from her mother's viewpoint. Oh I love my wrap!!! I got it when I was preggo with J and have loved it ever since. She just turned 2 and I still love it! I gave my hot sling to another expecting mother but I still have my moby wrap!! I wear my little guy every time we go out...he capped out at 27 inches at 4 months, so we've had to move to a sturdier carrier, and he actually likes it quite a bit, he naps when he's tired and he can peak up and out when he's awake! I'm a labor doula, childbirth educator and lactation counselor. Babywearing is one of THE BEST things you can do your you and your baby!!! You go Mama!!! I'm stopping by from Mom's Monday Musings - just found you and am now following!!! Keep wearing that precious one! Thank you for stopping over & following, Jill. I'm a huge fan of babywearing. Completely agree with your mention that the time you took a stroller along you'd wished you'd had the wrap. We adopted a stroller left by a garbage bin (in great condition) while in Italy, and I've used it only a handful of times. It actually serves as the baby's high chair for mealtime rather than an outdoor walking accessory. My littles is now 11 months, and I still find my sleepywrap to be comfy and wonderful. Thanks so much for linking up with Monday Mom Musings this week! Love having similar minded mamas sharing what works for them! I liked the Moby but it was too warm for my son and I. I ended up with a front pack that was something like an Ergo with my first son...and used it forever. Got lots of comments from older folks commending me on keeping him close to me :) He was almost a year old before we got a stroller and my mother-in-law uses it more than me. I may use the Moby more with the one I'm having in a month or two...it will be cooler!